Twenty-nine percent of the EU27 land surface is covered by mountains (EEA 2010), and forests cover 41% of the European mountain area providing a disproportionately large number of ecosystem services (ES). Often, the demand for ES from a single parcel of mountain forest is manifold, including protection from natural hazards such as rockfall and avalanches, timber prdouction, and landscape aesthetics (regarding tourism and recreation). Nature conservation values and biodiversity aspects are often involved as well. Mountain ecosystems can only continue to provide all these services in a rapidly changing world if a wide array of ES is considered in forest management at local, landscape and regional scales. In Europe, a general framework aimed at securing multiple services of forest ecosystems in the context of sustainable forest management was defined by the Ministerial Conference for the Protection of Forests in Europe (MCPFE, 2003). However, this concept has yet to be made operational at regional and local scales. The ARANGE project has the ambition to generate significant contributions. 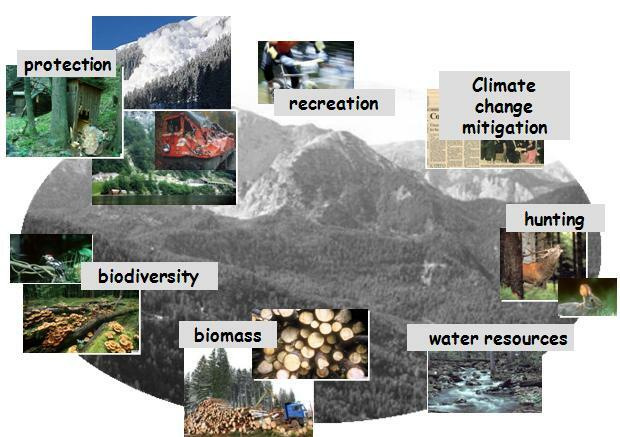 Recommendations for multifunctional forest management strategies – ARANGE findings now available!